Business Insider/Mary HanburyTJ Maxx offers discounts on designer clothing. 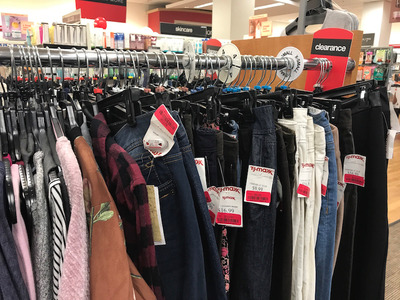 TJ Maxx is the United States’ largest off-price chain and is known for being a bargain hunter’s paradise offering 20% to 60% off designer clothing. To advertise its discounts, TJ Maxx tags items with its own price versus what it would cost at a full-price retailer. A group of four customers is suing the company, claiming that these comparison prices are “fictional” and misleading. A group of shoppers is accusing TJ Maxx of deceiving customers with misleading discounts. The United States’ largest off-price retailer is known for being a bargain hunter’s paradise, offering discounts of 20% to 60% on designer clothing. To highlight these deals to shoppers, it tags most items with its own price versus what it would cost at a full-price store. This is identified as the “Compare At” price on the tag. “The comparative price is not a bona fide price, but rather, an unverified estimate of what Defendant believes comparable products may sell for at other retailers,” the plaintiffs claim in the lawsuit. “Prices vary among other sellers and change over time, but our buying staff’s goal is always to provide you with a useful comparison based on prices at which we believe substantial sales of the same or a similar item have been made at full-price department or specialty retailers in the area or online,” it says. A spokesperson for TJ Maxx declined to comment on the lawsuit but said in an email to Business Insider that customers are well-informed on what its “Compare At” prices mean through signs in its stores and information on its website. This isn’t the first time the off-price retailer has come under scrutiny for its pricing tactics. In 2015, a class-action lawsuit was filed against the company in California by two plaintiffs who accused TJ Maxx of “using deceptive comparative prices to trick its customers into mistakenly believing they are saving specific and substantial amounts on name brand items,” ABC News reported. A California judge ruled in favour of the plaintiffs, and TJ Maxx’s parent company, TJX Companies, agreed to an $US8.5 million settlement. Customers who purchased products with a TJX price tag that included a “Compare At price” at any of its TJ Maxx, Marshalls, or HomeGoods stores in California between July 17, 2011 and December 6, 2017 were eligible to make a claim. The company declined to comment on this suit.